A view of the five F-1 engines on the Saturn 5 that launched NASA’s Apollo 11 from Kennedy Space Center in 1969 (Credits: NASA). 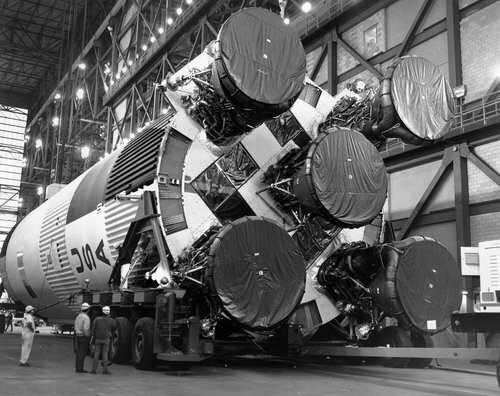 In 1969 Apollo 11 launched atop a Saturn 5 rocket. The five F-1 engines on the first stage of that rocket dropped into the Atlantic Ocean as planned, minutes after take-off. And there they have remained, at the bottom of the ocean, undisturbed – until now. The nearly 6 meter engines were located using “state-of-the-art deep-sea sonar” according to Bezos’ statement, over 4,000 meters below the ocean surface. Bezos has not indicated when or how many of the engines will be resurfaced. The engines are property of NASA, but Bezos hopes NASA will allow one of them to be displayed at a museum in Amazon.com’s home town of Seattle.